Notes: August 1999 - From the path below, its bole appears massive and solid. This is misleading - from the churchyard it is possible to walk into the tree's hollow which leans several feet out over the pavement. There has been fire/smoke damage. In 2016 Paul Wood noted no change in the appearance of the tree. Latest information: March 2002 A tree survey, commissioned by the Caring for God's Acre project was carried out by Phi Evans. No signs of disease or dieback were found. The good condition of the wall which bears some of the tree's weight was noted. The scorch marks inside the trunk were 'probably due to vandalism rather than lightning'. The following was written by John Gunson (2007) for a Yarpole journal:Did you know that the big yew tree in St. Leonard`s Churchyard at Yarpole is internationally 'web-famous'? In 1999, Tim Hills of Bristol came to visit the yew tree, as part of his millennium survey of ancient yew trees. He was undertaking a photographic and descriptive record of these venerable trees over a two-year period. He visited St. Leonard`s on 12th August 1999, ours being one of 71 in Herefordshire. According to the Churchyard Handbook, 'the value and significance of yew trees cannot be overestimated. Many are important historically and they are of considerable, even exceptional, antiquity'. 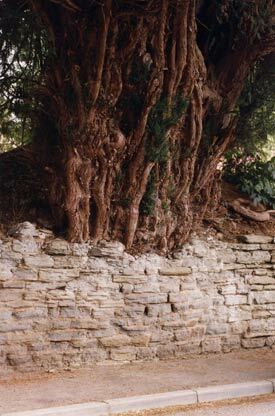 He left a note of his observations: 'This is the only yew tree I have seen so successfully growing above a wall. It appears to be a healthy and thriving tree'. He also left a question: 'Do you have a policy that enables it to flourish in this unusual location, or is it just good fortune?' Since then he has continued with his survey both in this country and overseas. His web-site, www.ancient-yew.org/treeInfo.php?link=865, gives an extensive record of all the trees that he and his colleagues have seen. In March 2002 a tree survey, commissioned by the Caring for God's Acre project was carried out by Phi Evans. No signs of disease or dieback were found. The good condition of the wall, which bears some of the tree's weight, was noted. The scorch marks inside the trunk were 'probably due to vandalism rather than lightning'. (The Fire Services attended a fire in the tree in the late 1970s).Statistics: Girth at the top of the wall is 24ft 3ins. Approximate height above the wall is 55ft. Approximate width at its widest is 60ft. Estimate of age is difficult to determine; “A yew that has grown to this sort of girth, lost its centre and split apart, is undoubtedly of vast age, I think it would be safe to say 1000+yrs. This makes it considerably older than the present church and would suggest to me a previous site of worship or an important meeting place in Saxon times` (personal communication from Tim Hills).